The head of Tokyo's Chabad House, Rabbi Binyamin Edery, named as Japan's first Chief Rabbi. For the first time, Japan is to get a Chief Rabbi. The head of Tokyo's Chabad House, Rabbi Binyamin Edery, was named to the job by the Japanese legislative body, the Diet. Rabbi Edery has served as head of the Chabad House for 16 years. The Israeli Chief Rabbinate has considered Edery Chief Rabbi of Japan for the past three years, although for various internal reasons Japan has not – until now. In recent weeks, Edery was acknowledged by the Japanese government as its Chief Rabbi, and a ceremony confirming this took place. Rabbi Edery was presented with official credentials by the Japanese government's official representative, Yoshihide Suga. Among the signers of the document were Israeli Chief Sephardic Rabbi Yitzhak Yosef, Jerusalem Chief Rabbi Shlomo Amar, Migdal Ha'emek Chief Rabbi Yitzhak Grossman, head of the Eidah Hareidit Rabbi Naftali Finkel, and others. The wide variety of rabbis ensures that decisions made by Rabbi Edre'i will be accepted by rabbis around the world. In the last year, ties between Israel and Japan have grown increasingly strong. 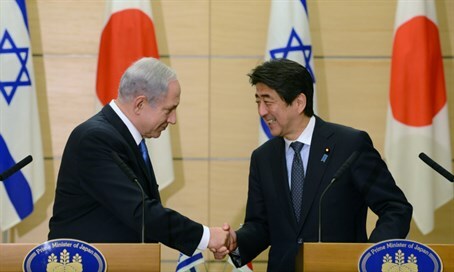 In May 2014, Prime Minister Binyamin Netanyahu visited Tokyo and met with Japanese leader Shinzo Abe, and in January of this year Abe returned the favor and visited Netanyahu in Jerusalem. Last June the Director of the Israel Space Agency made a first-ever visit to Japan, where he held important talks with Japan’s space-related ministries and agencies. A month later the Japanese Minister of Economy, Trade and Industry made his own first-ever trip to Israel, where the Israel-Japan Business Forum discussed joint investments in start-ups, hi-tech research and development (R&D) and cyber security. The Israeli Minister of Science visited Japan last October, where he and the Japanese Minister of Science and Technology vowed to advance cooperation in the vital field of science and technology. That same month, Japan's Deputy Foreign Minister came to Jerusalem for a Japan Culture Week where various aspects of Japan's traditional culture and modern society were introduced. The event was paralleled by Israeli cultural activities held across Japan.